Sagittal T1 and T2 w images show intradiscal vacuum phenomenon at L4-5. Gas in the disc space first analysed by Ford in 1977, is an ~ 90% nitrogen combined with oxygen, carbon dioxide and other traces of gases. VP is described in every segment of the spine including the disc space, Schmorl nodes, vertebral body, the epidural and intradural spaces and facetal joints. Intradiscal VP is commonest, observed in up to 20% elderly individuals. Most of the articles related to intra discal VP are based on plain radiographs and CT findings, although MRI being the preferred diagnostic method for spine, suffers a reduced sensitivity in detecting gas. Intradiscal VP can be marginal or central. An anterior marginal VP means a crack in the peripheral fibres of the annulus fibrosus caused by a traumatic or degenerative process. A central VP can be found in many conditions characterized by the development of horizontal intra discal clefts. Disc degeneration is the commonest cause of a centrally positioned VP. 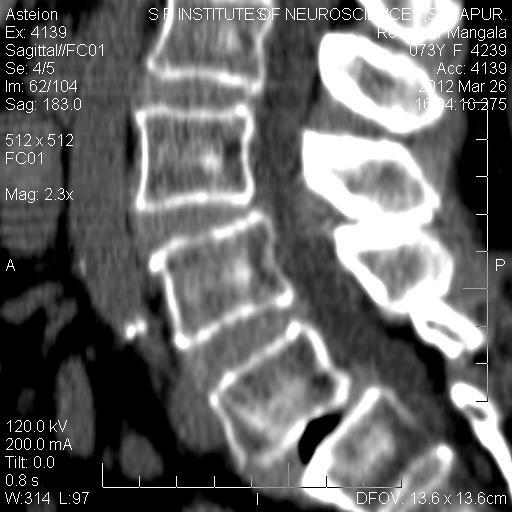 On MRI intra discal vaccum phenomenon is seen as a streak of signal void (‘z’ black) on T1 as well as T2 w images. Most commonly seen in lumbar region. 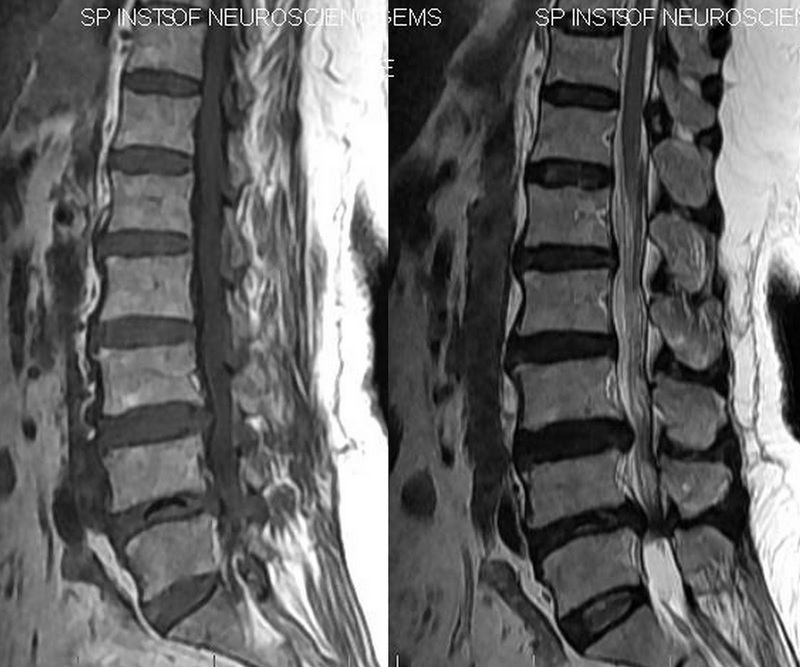 Associated with degenerative changes in the disc like disc desiccation, reduced disc height with endplate sclerosis, modic changes, marginal osteophytosis and adjacent segment degeneration. Sagittal reformatted images of spiral CT study at L5-S1 level shows Grade I anterior subluxation of L5 off S1, break in L5 pars on either side. Height of disc space reduced. Degenerative intra discal vacuum phenomenon noted as a 'Z'black air density in the disc space.